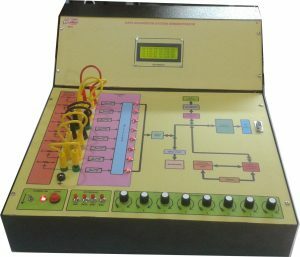 Microprocessor Data Acquisition System is a highly versatile system that offers the user number of facilities like selecting the scan rate, displaying selected channels through keyboard. It can also be interfaced to PC and the data can be transferred to the computer where it can be used for analysis. A to D converter used has 8 bit resolution and as such accuracy of the order of 0.025% can be achieved in ADC. The number of channels that can be scanned & eight (8).The data can be stored on line in the memory and printed off line. The display however is ON line. Analog input simulations module is provided. No. of channels : 8 channels. Scan rate : 1 – 9 seconds selectable. Scanning mode : Manual/Auto through keyboard. Signal levels : 0 – 5V. Memory capacity : 256 KB. Storing mach / display : Storing in RAM, 20 characters X 4 Line LCD display. Power fail condition : Provision is made to retain the data in RAM with battery back up. Facility to down load data to a PC through RS – 232 link. Simulation Module : 8 Channel [0-5V] Simulation by 8 pots. Power supply : 230 Volts, 50Hz.